The Society was established in 1932 and until 1965 met periodically in libraries, grange halls and private homes. 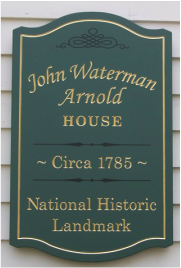 At that time they learned that the John Waterman Arnold House (c1785) was scheduled to be demolished by the city due in part to its rundown condition. The members approached the owners of the property and were granted the deed of ownership. As a condition of ownership the Society is charged with the maintenance and upkeep of the property; therefore between 1965 and 2007 the Arnold House underwent a number of restoration projects that has brought it to its present state. In 1972 the house was placed on the National Register of Historic Places and has been the headquarters of the Warwick Historical Society continuously since then. In 1965 the house was completely empty so the Society asked for donations of furnishings suitable to an 18th century house and the community responded. The majority of the furnishings present in the house today were donated at that time. The Arnold House is the only early historic building in Warwick open to the public at regular hours weekly throughout the year.